Sister Veronica Maria Stawski , died at Saint Joseph Villa on December 12, 2018, and was buried in the congregational cemetery following the Mass of Christian Burial at the Villa on January 4, 2019. Sister Veronica was born in Newark, NJ in 1924. She was baptized in Blessed Sacrament Church and attended the parish elementary school. Her parents were active members of the parish and as she grew up, she followed their good example, and spent much of her time helping in church and school. She was the daughter of proud Polish Americans and spent much of her time helping others. As she frequently said about herself, she was always “on the move and always liked to be on the run.” When she was a girl, it was by bicycle; when she was older it was by car, and finally, when she was at the Villa, she walked the halls using a unique cane created by her nephew, Jimmy. Ron’s younger years were spent living through The Great Depression; she shared the fact that she would pedal her bicycle through the neighborhood, doing errands for people and picking up day-old cookies and cookie crumbs to share with her neighbors in need. As soon as she was old enough, Ron joined the Girl Scouts, one of the few organizations that, at that time, allowed and even fostered, young women’s desire for service and development of leadership skills. It was a relationship that she treasured and one that shaped her life. She was a member of a troop, then a Leader in scouting and later a mentor of Girl Scout Troop 5. She earned something many young girls envied, the Diamond Chip Lifetime Girl Scout Pin. This desire to serve others and make the world a better place led eventually to her decision to become a Sister of Saint Joseph, which she did in 1943. Throughout her 75 years as a Sister of Saint Joseph, she thoroughly embraced the mission: to live and work so that all people may be united with God and with one another. Although Ron spent many years in education, she found that her skills were a best fit when she served in the New Community Corporation, an organization founded in Newark, NJ to provide jobs and housing for persons who are poor. Ron was again “on the move”, daily, as she worked with tenants to arrange appointments, to host community dinners and help residents to file income taxes and welfare forms—-ready for any good work. In her Living History, Ron wrote: “God is with you, hand in hand. Take one day at a time. Think positively! Be a happy person.” This is her legacy—-life lessons of many years. 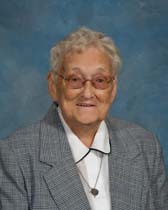 Let us celebrate the life of Sister Veronica Maria Stawski! After 94 years of being “on the move”, may she rest joyfully and peacefully in God’s loving embrace, surrounded by family and SSJs who have gone before her.